GULU – Gulu High Court was today, Monday, a beehive of activity as 33 people arrested over the August 13 election campaign violence in Arua Municipality applied for bail. As early as 9 am, the fully-packed court was already in motion, with some of the country’s finest lawyers Abdu Katuntu, Caleb Alaka, Medard Ssegona, Asuman Basalirwa, Samuel Muyiizi, and Nicholas Opiyo, among others, at hand to plead for the accused’s bail. The bail applicants, who had been charged with treason in Gulu Magistrate’s Court, included MPs Robert Kyagulanyi aka Bobi Wine (Kyadondo East), Kassiano Wadri (Arua Municipality MP-elect), Gerald Karuhanga (Ntungamo Municipality), Paul Mwiru (Jinja East) and former MP for Makindye Mike Mabikke. The others were Ssebuwufu John Mary Male, Musisi William Nyanzi, Atiku Shaban, Andama Bernard Male, Onen Muhammad Male, Andama Anwar Doka Male, Ijaga Muhammad 25, Wani Aloro, Asiku Tom, Ojotre Stephen, Odong John Bosco, Aniku Charles, Asega Abibu Jogo and Tamale Wilberforce. Others were Butelezi Noor Manzu, Akira Maida, Faruku Abdulrahman, Gamba Tumusime, Mandela Nelson, Obeti Simon, Draji Sam, Nalubowa Caroline, Galumbe Amid, Odong Rasul, Abwola Jane, Ijotre Bashir, Asara Night and Amidu Juma. Already on standby to stand surety for the group was a host of MPs and opposition leaders. Top opposition leader Dr Kizza Besigye was also in court. One by the one, the lawyers led by Alaka presented the case for the applicants’ bail before Justice Stephen Mubiru. The lawyer argued that besides bail being a constitutional obligation, the accused are in poor health and require further treatment. He then presented each of the applicants’ sureties. 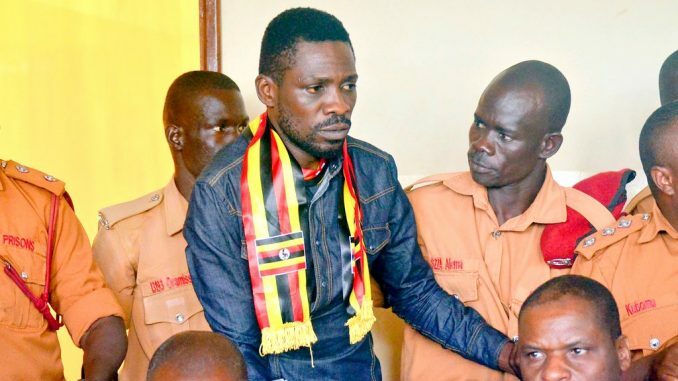 Bobi Wine’s sureties were Maj. Gen. Mugisha Muntu, Buyaga West legislator Barnabas Tinkasimire and Mr Eddy Yawe Ssentamu, Bobi Wine’s elder brother. MP Karuhanga’s sureties were Bukoto East MP Florence Namayanja and Nwoya District Woman MP Lilly Adong. Wadri presented former Leader of the Opposition Winnie Kiiza and Kabweri County MP Francis Gonahasa as his sureties. Mwiru was stood surety for by Soroti District Woman MP Angelline Osegge and Soroti Municipality MP Herbert Ariko. Leader of the Opposition Betty Aol Achan and KCCA Councillor Moses Katabu stood surety for Mabikke. Justice Mubiru then granted the suspects bail in two batches; first with the MPs and 11 others in the morning session and then the rest in the afternoon session. The court released the suspects on a Shs5 million non-cash bond each, while each of their sureties were placed on a Shs10Million bond. Justice Mubiru declined a prosecution request for court to hold onto the passports of the bailed suspects, stating that some of these might need them to travel for medication and that having to pick them in Gulu would be a big inconvenience. The Judge, however, ordered the applicants, particularly the Arua County MP-elect Kassiano Wadri not to go to his constituency and to refrain from holding in celebratory processions, as this could interfere with the case investigation. Jubilation then broke out in and outside court.